A Teacher Leaves The Classroom For Afghanistan Darryl St. George, 29, taught high school history on Long Island, N.Y. "But I felt like something was missing. ... I felt compelled to serve," he says. So he enlisted and became a Navy corpsman. His former co-workers had a tough time understanding that decision. A very small number of Americans are now serving in the military — less than 1 percent. Some are looking for direction; others are inspired by a sense of patriotism or by a family member who served in an earlier war. In the series Who Serves, NPR looks at those who have made a decision few others today have — to fight in America's wars. In Afghanistan's Helmand province, a Marine platoon had taken over an abandoned compound. It was little more than a vacant lot, choked with weeds and surrounded by high mud walls. One day last month, the Marines were getting set to head out on patrol. While they waited, they joked around in the Marine way: insulting each other, telling raw stories. Off to one side, one man sat alone against a mud wall. He was pensive, almost serene. He had a stack of books next to his gear. He introduced himself as Darryl Richard St. George, a 29-year-old from Long Island, N.Y., who used to teach high school history. Now he cares for wounded Marines. "I taught 10th and 12th grade. I loved teaching; it was a great job," St. George says. "But I felt like something was missing. I kind of — I felt compelled to serve. So I looked into taking a leave of absence and I enlisted in the United States Navy for five years to be a corpsman." St. George says that "something missing" had to do with the fact that amid all that was going on in the world and in the United States, people seemed to have forgotten about what's going on in Afghanistan. "That didn't sit very well with me," he says. "I had known a number of people who'd served, and some students as well; one student who was a Marine and died in Iraq. All of those things kind of rolling around in my head, I wanted to — how can I put this? — I wanted to directly contribute in some way." There was also family tradition. His father served with the Marines, like his father and grandfather before him. But St. George said his father was worried when Darryl decided to join. His father had come to dislike the Marines' hard-charging, hard-drinking culture. And he worried about his son's safety in a combat zone. St. George's fellow teachers at Northport High School on Long Island also told him not to enlist. "They were very much against it. And some were angry with me," he says. "A very good friend of mine was very angry with me, like to the point where he didn't talk to me for a few days. I never resented him for that because I realized it was out of concern; he didn't want anything to happen to me." St. George says his co-workers had a hard time understanding why, as a teacher with a good job, tenure and a master's degree, he would go and join up — and not even as an officer. A lot of people tried to talk him out of it, but he doesn't think it was because they had an elitist perspective. "I worked with a lot of open-minded people and good people," he says. "I think their opposition to my decision was more out of concern and care for me as opposed to anything politically motivated." After the patrol that day in Helmand province, the sun was setting at the compound — a wide golden sky. The Marines spread out their sleeping bags, and some Afghan soldiers kneeled for evening prayer. St. George considered the question of who serves in the military. He said he worries that military service is used by some as a political bludgeon. "They oversimplify it," he says. "They make it like, if you're going into the military you're patriotic, and those who don't go into the military [are] unpatriotic. I think it's very unfair to do that." It all has to do with perspective, St. George says. "We all have a certain perspective when it comes to our country and the idea of service." As a teacher, for example, he always saw himself as also serving his country, he says. And at times, in this combat platoon, St. George says he still serves as a teacher. 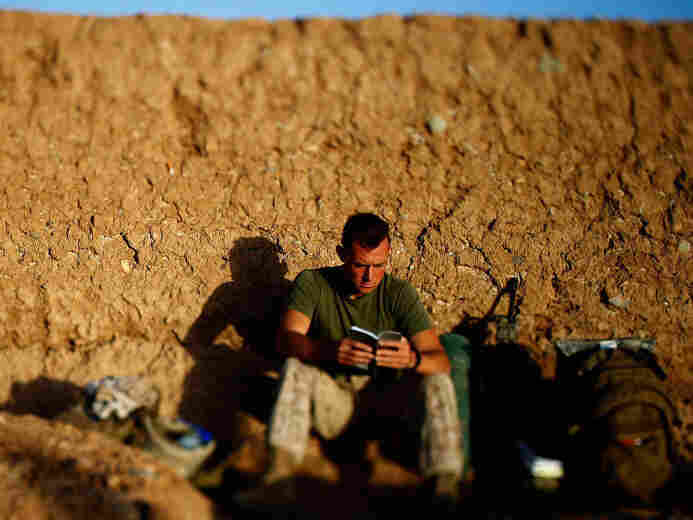 At first the Marines joked about books and his master's degree. Now, some talk with him about what he's reading or get into long conversations. "I couldn't think of being with a better group of guys than these Marines. They've got more heart than anybody I've ever met," he says. It's St. George's job to tend to these Marines when they're wounded. He says the Marines have taught him determination and perseverance, and he says he's been trained well. As of last month when he spoke to NPR, he hadn't had to treat any serious wounds. "We've had some close calls. We've had, like, Marines who've taken bullets to the Kevlar and abrasions on the back of their head, but nothing more than that. ... For me, my faith — God has really been looking over us. But the weather's getting warmer now, and there's a lot of fear and there's a lot of apprehension in terms of what could happen in these final months of our deployment, but I hope that this streak will continue." A little more than a month is left in that deployment — and then it's home. St. George plans to visit Northport High School in the fall, to see the students and the teachers he left behind. He wants to remind them, he says, that things are still happening in Afghanistan.